Here’s another fun bridal party photograph. This time everyone is doing “the jump." It’s great to be able to freeze and study the movements and faces on these bridal party members. 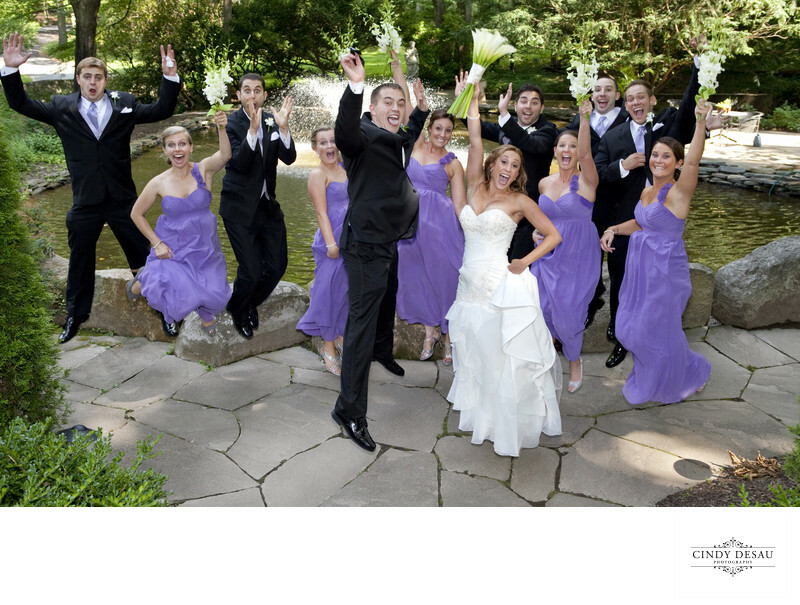 You might think it is a relatively new trend to do jump photos. But that is not true. It actually started with the famous portrait photographer Philippe Halsman in the 1950's. This is what he said: "Starting in the early 1950s I asked every famous or important person I photographed to jump for me. I was motivated by a genuine curiosity. After all, life has taught us to control and disguise our facial expressions, but it has not taught us to control our jumps. I wanted to see famous people reveal in a jump their ambition or their lack of it, their self-importance or their insecurity, and many other traits." –P.H. I’m sure photos like these are treasured by the bride and groom and are probably hanging in their home as fun reminders of the most important day in their lives.